Last December, President Donald Trump announced, via Twitter, that he was ordering his staff to execute a “full” and “rapid” withdrawal of United States troops from Syria, declaring the United States had defeated ISIS. International allies of the U.S. were blindsided by the announcement, as well. Tobias Ellwood, a minister in the British Ministry of Defense, said in a tweet that he “strongly” disagrees with Trump’s comment that ISIS had been defeated. “It has morphed into other forms of extremism and the threat is very much alive,” Ellwood wrote. As of December, the U.S. has about 2,000 troops in Syria, where they are primarily training local forces to combat ISIS. 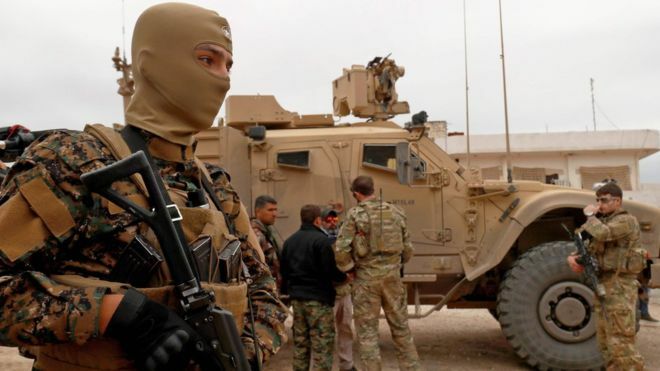 There has been some recent success against the terror group and the combined US-backed and Kurdish-led Syrian Democratic Forces are on the cusp of capturing the last major town held by ISIS east of the Euphrates. White House spokeswoman Sarah Sanders said in a statement: “We have started returning United States troops home as we transition to the next phase of this campaign.” She added that United States victories didn’t signal an end of the global coalition on ISIS or its campaign. On Friday, February 1, Trump acknowledged the possibility that ISIS and other terror groups could regain their strength in Syria and Afghanistan if he withdraws or reduces troops in those countries and noted that he would send United States forces back if they did. The Pentagon has warned that ISIS could re-emerge and take back territory in Syria within months if the U.S. does not maintain military pressure on the terror group. An official report is set to be published next week, and is expected to state that ISIS could regain territory within six months to a year of a U.S. withdrawal.